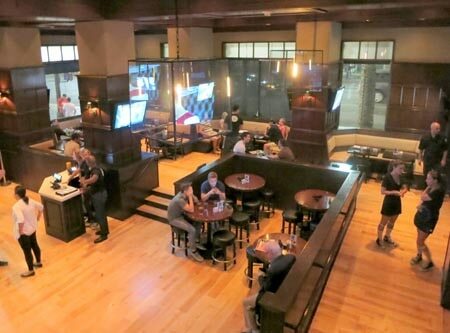 A Hollywood sports bar featuring American bar food, 55 HD TVs and 33 taps of draft beer. Open late nightly until 2 a.m.
: There are thirty-three beers on tap at this huge sports bar located in an elegant old building in the heart of Hollywood. Fifty-five HD TVs broadcasting professional and collegiate sporting events are displayed all over and showcased by mahogany wood on the walls. A majestic staircase will lead you upstairs to more TVs, another bar, more dining tables, and foosball and pool tables. Yes, 33 Taps is a sports bar, but the food is such that you may just go there for it and not watch any game. The menu is what you would expect from this kind of place. We like everything we’ve tried: spicy wings, pulled pork sliders, the simple burger and pepperoni flatbread with house-made tomato sauce. All of this may be finished with a yummy warm cookie topped with vanilla ice cream. The beers are mostly American and moderately priced, so you can enjoy a few during the games. Bartenders have created interesting cocktails as well, so make sure to try one. 33 Taps is open in the morning if there's a game. 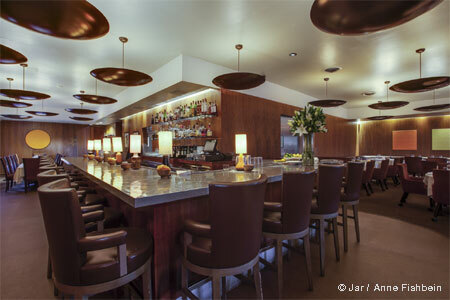 Also located at 3725 W. Sunset Blvd., Los Angeles, 323-338-7777.